Dancers started Block 7 with lunch, and despite heavy legs and fatigue, participants enjoyed numerous guest appearances that kept energy high throughout the block. As dancers returned to the tent for the start of the block, they picked up food and enjoyed complimentary cookies made by Felix Castillo, an 11-year-old boy who founded Felix’s Famous Cookies. Early on, Dance Marathon leaders announced the $10,000 in 10 hours campaign had already met its goal, and by the end of the block, another $9,000 had been raised, members of the finance committee announced. Northwestern alumni at a meet-up in New York City also greeted the dancers via Skype, and a speaker from Stagg Elementary School in Chicago spoke about Blessing in a Backpack’s impact. In addition, actress and singer Hailee Steinfeld appeared in a celebrity video to support the dancers. 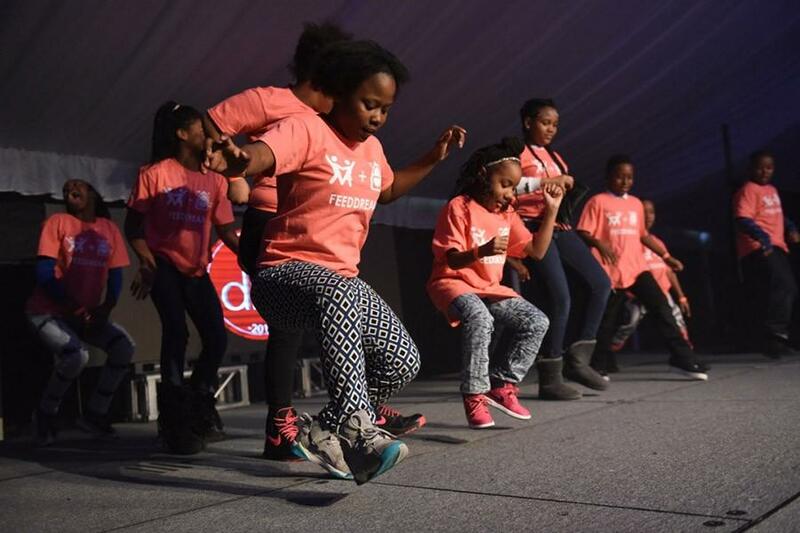 While the dancing took place inside the tent, kids from Evanston and Chicago-area communities participated in a fair on the ground floor of Norris University Center. Dancers in the 90-Hour Club were able to play and interact with the kids during the fair, which featured arts, crafts, live music and games. Weinberg sophomore Saeed Saeed, a member of Smoke and Mirrors: NU Magic, helped out at the fair with the magic club. He performed card tricks for kids and said he enjoyed helping the kids have a special DM experience. Later, several dance performances by special guests kept the crowd engaged. Football coach Pat Fitzgerald and several members of the football team appeared on stage, and Fitzgerald thanked the dancers for their dedication to a great cause. “This is what makes Northwestern so special,” Fitzgerald said before letting his players take the stage to dance. Following the football team’s appearance, two boys from Blessings in a Backpack families took the stage and showcased their dance moves, receiving enthusiastic applause from the dancers. For the rest of our DM coverage, click here.